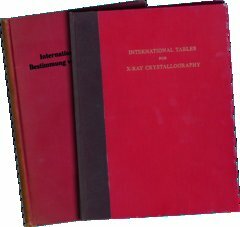 International Tables for Crystallography is the oldest publication of the IUCr, with the first two volumes being published in 1935, i.e. twelve years before the establishment of the Union. Since then revisions and new volumes have appeared regularly. The current series, which is published in collaboration with Wiley, includes eight volumes as well as the Brief Teaching Edition of the space-group tables. A ninth volume, on powder diffraction, should appear in early 2015, and a tenth, on XAFS, is planned. The series as a whole attests to the very great scope and depth of the field of crystallography. The International Tables are much more than just a set of space-group tables. The first of the two original volumes of the 1935 edition and a volume of the 'red' series that began in 1952. The 'blue' series of the 1990s. 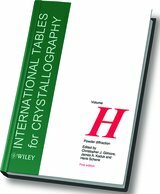 The next volume of International Tables for Crystallography; it is expected to appear early in 2015. An example of electronic access to International Tables for Crystallography. Without the conventions that were developed in the early 1930s it would be impossible to assume, for example, that in monoclinic crystals it is the b axis that is unique and that in trigonal and hexagonal crystals it is the c axis that is unique. Without a standard reduced cell it is very difficult to know whether two triclinic cells with similar volumes are the same or not. Imagine the confusion there would be without these conventions. The difference between the publication date (1935) for the first two volumes and the date given at the end of their preface (1932) is a reminder of how slow the publication process used to be. A lively history of the tables is included in H. Kamminga's article [Acta Cryst. (1989). A45, 581–601] about the early days of the IUCr; this article can also be found at www.iucr.org/iucr/history/early-history. 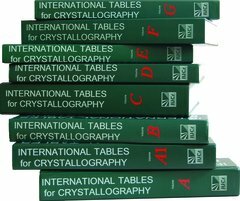 Each volume of the series covers a specific area of crystallography. In the early days most of the material was intended for working crystallographers. If the printed volumes were not so physically large each could be described as a vade mecum. With the advent of web access and small electronic devices, however, the size of the printed volumes is no longer so important; the series can now indeed function as a portable pocket reference. The volumes contain useful material that is difficult, or perhaps even impossible, to find collected elsewhere. In many cases (e.g. space groups, scattering factors) it is important that there be a standard, authoritative reference. Furthermore, having the material collected is not only convenient but also allows a more unified approach than would otherwise be possible. In the online editions the many links within and between volumes simplify navigation and suggest connections between topics. 'The aim of the present compilation is to facilitate the work of three categories of scientists: those who are actually engaged in the determination of crystal structures, those who are using X-ray methods in the study of crystals in general, and students of crystallography.' The educational role has expanded with time. While students using early volumes might have needed considerable help (I remember my own days as a graduate student), newer volumes have been written with the needs of the less experienced in mind. The publication in 1985 of Brief Teaching Edition of the space-group tables was an important step in bringing the tables to a wider audience. Vol. A Space-group symmetry (1st edition 1983; 5th edition 2002; online edition in 2006; editor Mois Aroyo, who succeeded Theo Hahn); Vol. A1 Symmetry relations between space groups (1st edition 2004; 2nd edition 2010; online editions in 2006, 2011; editors Hans Wondratschek and Ulrich Müller); Vol. E Subperiodic groups (1st edition 2002; 2nd edition 2010; online editions in 2006, 2010; editors Vojtech Kopský and Danny Litvin) and the Symmetry Database (2011 onwards; also the responsibility of Mois Aroyo). These volumes are the authoritative tabulations of symmetry groups. Vol. A includes the two-dimensional plane and three-dimensional space groups and is used regularly by most crystallographers; it is the successor of the first volume of 1935 but includes later revisions such as the 1995 introduction of the symbol e for a glide plane with translations in two directions (e.g. Cmce, formerly Cmca). The two-dimensional plane groups in Vol. A (and in the Brief Teaching Edition) are often used for teaching, perhaps in combination with Caroline MacGillavry's book of M. C. Escher's periodic drawings. The revised version of Vol. A that is expected to appear in 2014 will include new graphic representations of the cubic groups, and the online edition will include Seitz symbols [see Glazer, Aroyo & Authier, Acta Cryst. (2014). A70, 300–302]. Extended information about symmetry relationships is available in Vol. A1, which includes symmetry trees showing the relationships of the space groups. These trees are useful for tracing symmetry lowering, such as may occur during a series of phase transitions or as a result of chemical substitution. The frieze, rod and layer groups are collected in Vol. E (see table on below). They are termed subperiodic because they are not periodic in all dimensions. The layer groups are needed for describing interfaces and also the structural layers that can be identified in many crystals. Rod groups are essential for characterizing fibers (note that the cross sections of the 'rods' need not be circular) and are also useful for describing columnar packing units such as hydrogen-bonded chains. The Symmetry Database is an electronic resource that allows real-time manipulation of symmetry information, including all that found in the printed volumes of International Tables. The Symmetry Database facilitates studies of group–subgroup relations, domain structures and twinning, and relationships between members of crystal-structure families. Information about superspace symmetry (i.e. for describing modulated, and especially incommensurately modulated, structures) is currently located in Vol. C.
A volume including a compilation of the magnetic space groups (or time-reversal groups or black-white space groups) is being discussed. In the meantime an e-book by Danny Litvin on magnetic space groups has been published by the IUCr (www.iucr.org/publ/978-0-9553602-2-0) and can be downloaded freely. The 1983 edition of Vol. A was the first to be based on computer-generated space-group information. Computerization has increased steadily since then, culminating with the Symmetry Database and with computer generation and checking of the magnetic space groups. Vol. D Physical properties of crystals (1st edition 2003; 2nd edition 2014; online editions in 2006, 2013; Editor André Authier). This volume is concerned with the influence of symmetry on the physical and tensor properties of crystals and on their structural phase transitions; it therefore describes applications of the symmetries described in other volumes (especially A and A1). Part 1 introduces the mathematical properties of tensors and group representations and tabulates the independent components for each of the three-dimensional crystallographic groups. Several examples of tensor properties are described: elastic properties, thermal expansion, magnetic properties, linear and nonlinear optical properties, transport properties, atomic displacement parameters, and local electric susceptibility. Part 2 is devoted to the symmetry aspects of excitations in reciprocal space: phonons, electrons, Raman scattering and Brillouin scattering. Part 3 deals with the symmetry aspects of structural phase transitions and twinning. An important feature is the joint description of twinning and domain structures, which are usually presented in completely separate ways in handbooks of physics and of mineralogy. Vol. B Reciprocal space (1st edition 1993; 3rd edition 2008; online editions in 2006, 2010; editor Gervais Chapuis, who very recently succeeded Uri Shmueli); Vol. C Mathematical, Physical and Chemical Tables (1st edition 1992; 3rd edition 2004; online in 2006; editor Richard Welberry, who succeeded Ted Prince and then Hartmut Fuess). These two volumes can be traced back to Vol. II of the original series and Vols. II–IV of the 'red' series. Over the years, Vols. B and C have grown by accretion (especially C) to the point of being difficult to describe. Furthermore, many of the tables (e.g. X-ray scattering factors) need no longer be printed, although having them available in an authoritative electronic form is important. The current editors of these volumes are working closely together on very major revisions. The original plan was for B to focus on topics more related to its current title (Reciprocal space) and for C to cover topics more connected to direct space, but it has become clear that such a simple division of topics is impossible. Vol. H (Powder Diffraction) (to appear in early 2015; editors Chris Gilmore, Henk Schenk and Jim Kaduk); Vol. I (XAFS methods) (in development; editor Chris Chantler; joint main editors Federico Boscherini and Bruce Bunker). 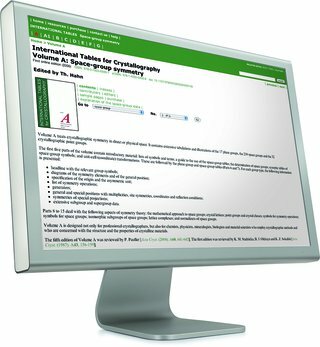 These current and future volumes are in-depth handbooks designed for scientists interested in specific areas of crystallography. The volumes are intended to be indispensable for groups working and training students in these areas. Vol. F takes the reader through all stages of structure determination and analysis for biological macromolecules, from those as small as short polypeptides and nucleic acid oligomers to those as large as a ribosome. Vol. F includes a historical perspective (along with many classic references), theoretical crystallographic background, descriptions of methods and information about experimental techniques. The articles are written by experts but should be accessible to anyone with a scientific background. Vol. F is the most authoritative single-volume collection available of articles on structural biology. Vol. G provides an overview of the requirements for precise descriptions of crystallographic concepts and quantities in the design and execution of scientific software. While the volume concentrates on the specific interchange format (CIF) developed by the IUCr and provides a complete reference for CIF programmers and users, it is also of wider use in developing a formal language of crystallography to be used by computer programs and processes. The CIF data dictionaries, which are most easily searched electronically, account for half the pages. A historical introduction provides a perspective on why the CIF language has the form it does and how it is related to XML. Vol. H is intended to be a one-volume summary of best practices and state-of-the-art applications of powder diffraction; its target audience includes both beginners and advanced practitioners. It will have sections on instrumentation and sample preparation, methodology, structure determination (including structure validation), defects, texture and microstructure, and software, as well as many chapters on applications in specific fields such as macromolecules, ceramics, cement, polymers, energy storage, petrochemicals and cultural heritage. The electronic version of Vol. H will include extra digital materials. Many authors have included raw diffraction data discussed in their chapters so that the reader may reproduce the data processing that is discussed. Vol. I (XAFS methods) is still in the planning stage. A Vol. J is being discussed with the Commission on Magnetic Structures. The printed volumes can be purchased individually. Some of the newer volumes originally included a CD with accompanying software; more recently that software has been made available online. Online access is for purchase by institutions and includes access to all volumes. Purchase of the package includes all the extra electronic resources associated with the volumes as well as access to the Symmetry Database. The 'Guided Tour', available at http://it.iucr.org/services/guidedtour/, is highly recommended because it shows what is available electronically. Access to the Tables of Contents for all the volumes is free, as are sample pages (including author lists and prefaces); see the homepages for the individual volumes (e.g. http://it.iucr.org/F/). Links to published reviews for the individual volumes are given at the bottoms of their respective homepages. 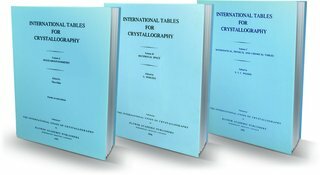 The volumes of the International Tables for Crystallography are a marvelous resource for anyone working in, or interested in, crystallography. While the volumes have been developed individually over decades they are now richly interconnected via the many links in the electronic editions. Investigation of a question about the organizing principles behind a layered structure might well start with the space-group tables of Vol. A but then go on to the space-group relationships detailed in Vol. A1 and to the layer groups listed in Vol. E, and then perhaps to the tensor information in Vol. D. New students in macromolecular labs and powder-diffraction labs should find Vols. F and H very useful. Many of us think immediately of the space-group tables of Vol. A when the series International Tables is mentioned, but those tables represent only a small part of the information included. In closing, it is essential to remember that these volumes would not exist but for the countless hours donated by the many editors and authors who have been involved with the series. It is difficult to thank them enough for their contributions.